Computers, in their atavistic avatars, may have been used exclusively for number crunching and data computation. But in modern times, one of their core purposes in life is helping you escape reality by immersing yourself in an alternate, fascinating world. Or, in other words: gaming. 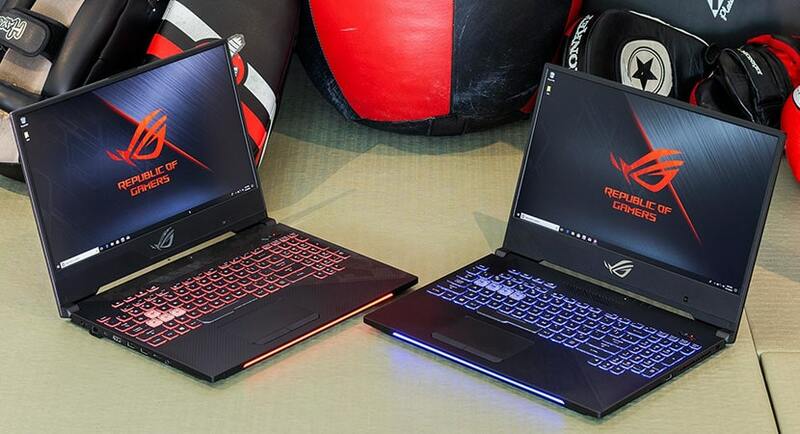 With more and more computer manufacturers jumping on the video-game bandwagon, the marketplace is replete with gaming laptops that help you contest with foes on the battlefield and emerge as the victor. For a gaming device to offer you a competent mix of performance and A/V merits, it must have both a high-speed processor and a display with an optimal refresh rate. While the former helps you run the latest AAA titles, complete with all the CPU-heavy paraphernalia they require, the latter is essential to minimize stutter and ensure that the games get rendered as the makers intended them. It is in achieving this combo that many brands struggle. This is why locating a high-performance gaming laptop with a refresh rate of 144Hz, and a price tag that doesn’t burn a hole in your wallet is an immensely tall order. In this comprehensive article, we have culled out a list of the ten best gaming laptops under $1500 that also offer a refresh rate of 144Hz. Most of these laptops are from the stables of reputed computer manufacturers and promise sustainable, reliable gaming experiences. We have designed the list to suit a variety of need and priorities—from cost-effectiveness and superior battery life to additional gaming features sought out by pros. But before we dive into this mesmerizing world, let us find out something crucial about the world of gaming: the importance of refresh rate and how to locate a computer that knows it too. What is Refresh Rate & Why is it Important in a Gaming Laptop? The refresh rate of a laptop is defined as the number of times in one second that the screen updates itself. A higher refresh rate is preferable for gaming because it lets you see more frames per second. The result will be a smoother video with higher precision and more responsiveness. So, while the standard refresh rate for laptops is 60Hz (which means 60 times in one second), you are likely to find this lacking for heavy-duty gaming. For the latter, the recommended metric in 2019 is 144Hz. But wait—can the eye really detect a difference between a monitor with a 60Hz, 120Hz and 144Hz display? You bet! Yes, if you don’t intend to use your laptop for serious gaming and only ever play low-key games without fast-moving objects, you might get along fine with a 60Hz display. But for gameplay at high frame rates—where the fun truly belongs—you need a monitor that can update itself swiftly and let your eyes track movements realistically. This becomes almost imperative to play shooter and fighter games; it is less significant for strategy-oriented games. Note that the refresh rate is distinct from the response time which is the number of milliseconds it takes for a pixel to change color. But yes, this is also a crucial metric for a gaming laptop. If your display has a high response time and a low refresh rate, but you try to play a game at maximum frame settings, you are setting yourself up for stuttering and screen tearing. A high-speed processor (Intel Core i5 and above): This is critical to fuel your high-adrenaline gaming sessions. A high refresh rate won’t serve you well unless your CPU can back things up. A dedicated GPU: Integrated graphics are unlikely to be ample for fast-track gaming. Look for a laptop with a dedicated GPU (e.g., NVIDIA GTX). If you have the budget, you can also explore NVIDIA RTX GPUs and experience brilliant visual effects with real-time ray tracing. An anti-glare screen and an IPS panel: Since you are investing in a high-refresh-rate monitor, chances are you will be staring at the screen for long hours. An anti-glare panel and IPS compatibility (In-Plane Switching) will keep your experience strain-free and comfortable across viewing positions. Anti-stutter technology (NVIDIA G-SYNC or AMD FreeSync): While the best way to avoid screen tearing or stuttering is to invest in a laptop with an optimal refresh rate (144Hz or at least 120Hz), you can also explore technologies like NVIDIA G-SYNC or AMD FreeSync. These technologies reduce screen tearing and ghosting by synchronizing the display panel with the graphics card. So, the monitor will update only when the card sends a frame, thereby keeping the two in sync irrespective of the frame rate. A superior sound system: Games with fast-changing movements tend to rely heavily on sound for building realistic, captivating worlds. A laptop with acoustics that complements the 144Hz display will help you derive the best results. This 17.3” inch gaming laptop is the closest thing to affordable gaming nirvana. Not only does the ASUS ROG Strix SCAR II offer a gorgeous, 144Hz, thin-bezel (5mm or 0.19”) display with NVIDIA GeForce GTX 1060 graphics, but it is also equipped with a powerful Intel Core i7 processor, 16GB RAM, and 256GB of SSD Storage (with 1TB HDD). These specs are adequate to run your favorite games at satisfying settings. Moreover, the display also offers a swift response time of 3ms and a color gamut of 72% NTSC. This further enhances the realistic appeal of the gameplay. This laptop keeps its performance sustainable with a Hypercool Pro thermal system that employs two 12V fans, three radiators and an anti-dust technology to ensure that heat does not obstruct fantastic gaming. 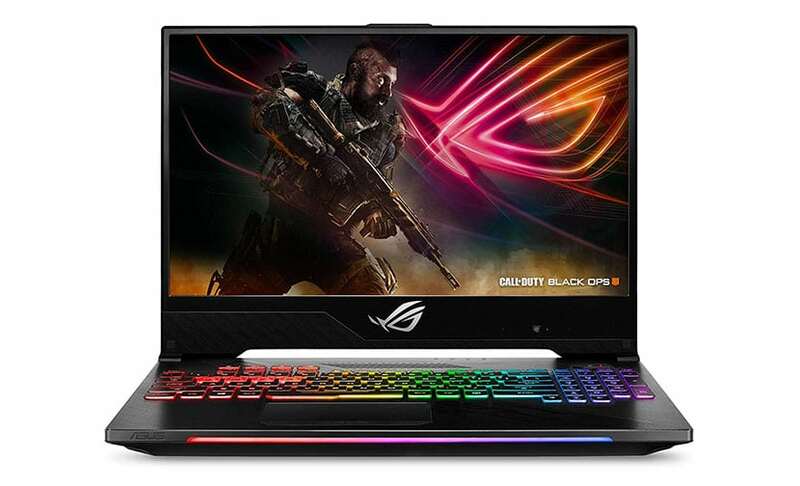 In light of ASUS’s recent tie-in with Activision to bundle Call of Duty: Black Ops 4, it becomes even more important for the laptop to retain its cool while running this intense, highly anticipated game. With this ASUS ROG laptop, you get an RGB gaming keyboard (ASUS Aura Sync) with a lighting bar. This creates glorious ambient lighting to complement the proceedings in the virtual world. In fact, everything about this computer is designed to enthrall, including the charming exterior. The “Kevlar weave” design (3D weave overlaid with color) with camouflage-inspired markings guarantees that your machine will stand out even in a room full of stylish laptops. It is available in two contrasting brushed finishes—anodized gunmetal gray and deep-black. Note that the laptop weighs 6.5lbs and measures 1” in thickness. A special word for fans of online gaming conquests: You will love the 802.11ac Wave 2 Wi-Fi (Gigabit) that delivers up to 30% wider coverage, thanks to the quad antennas. You can also avail of several VR-Ready ports, including USB Type-C, HDMI and a Mini DisplayPort to connect to any devices or peripherals you may require for your game. 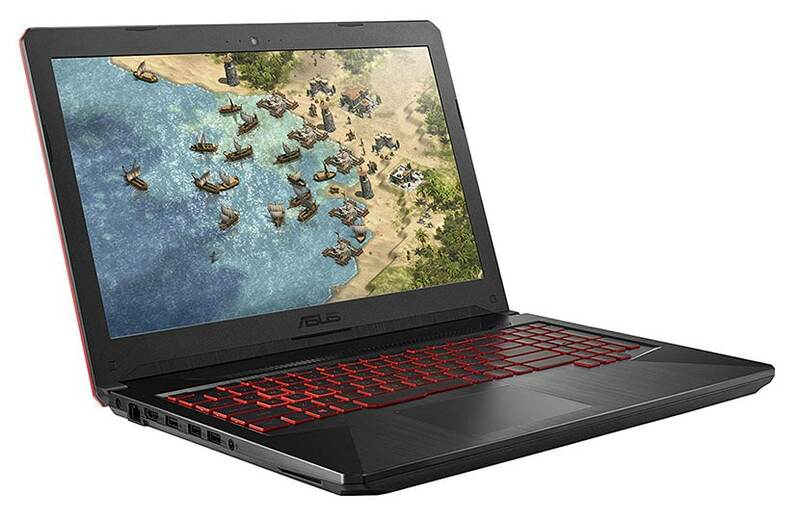 The second ASUS on this list is a 15.6” gaming laptop tailor-made for intensely engaging gaming experiences. The ASUS ROG Strix Hero II offers the winning amalgam of NVIDIA GeForce GTX 1060 graphics, an Intel Core i7 CPU, and a 144Hz display. Like its sibling in #1, this device also has a thin bezel (5mm or 0.19”), a fast response time of 3ms, and a color gamut of 72% NTSC. At 5.29lbs and 1”, it is quite portable for outdoor gaming sessions or competitive events. On the processing front, this laptop is sound. The CPU is ably supported by 16GB RAM and 256GB of SSD storage (with 1TB HHD). Since this laptop also offers the recent tie-in with Activision Call of Duty: Black Ops 4, you can make the most of the mighty processing configuration on a charming display. The heat dissipation is effective too, with the HyperCool Pro thermal system employing anti-dust technology to keep the computer running coolly. In the look-and-feel department, this laptop is quite a stunner, what with its two contrasting brushed finishes and a distinctive diagonal slash. The black-and-red color scheme is a classic, reflecting the power that this laptop holds within. It also offers a customizable RGB gaming keyboard with a lighting bar for ambient lighting. Bonus: The keyboard features a large space bar and four new hotkeys to give you more control over your game. It boasts of longevity too, with torture testing for 20 million keystrokes. To connect to the web, you can use the 802.11ac Wi-Fi (Wave 2 Gigabit)—a high-coverage provision with ROG RangeBoost technology. A plethora of USB ports is available for your devices like mice and external displays. A 15.6” machine that comes in at just under $1000, the Acer Predator Helios 300 is a marvel of design and function. 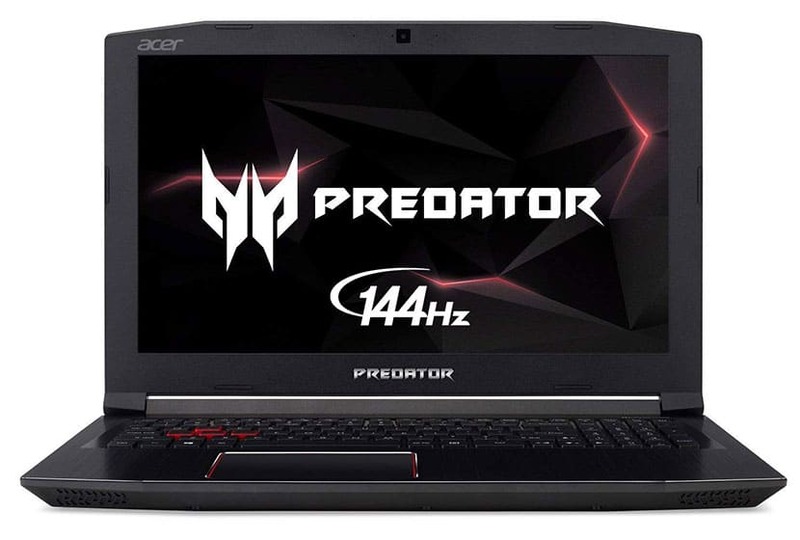 Fueled by an Intel Core i7 processor, 16GB RAM, 256GB of SSD storage and NVIDIA GeForce GTX 1060 graphics, this Predator is ample to run most modern AAA titles on a stutter-free, 144Hz display. The FHD screen is fitted with an IPS panel to grant you viewing comfort from multiple vantage points. To its merit, this computer also offers up to seven hours of battery life—a feature that does wonders for the portability of this already lightweight and slim machine (5.51lbs, 1.1”). While this laptop manages to meet a sub-$1000 price point, it does not compromise on the beauty of the display. Along with the high refresh rate, you get a brightness of 300 nits and a color gamut of 72% NTSC. This makes the colors and details pop, all the flourishes intact and vivid. Keeping everything cool is an AeroBlade cooling system with two metallic fans (3D). Acer has ensured top-notch design standards for this offering. The build features red accents and geometric lines—a combination that adds to the dramatic appeal of the black chassis. In stand-out features, this laptop brings you stunning sound; Acer TrueHarmony and Dolby Audio Premium combine to produce loud, clear audio that builds scintillating gaming sessions. Note that this device is equipped with abundant USB ports, a backlit keyboard, and 802.11ac Wi-Fi. So, connecting to peripherals or hopping onto the World Wide Web will not be a hassle at all. It is also fitted with an HD Webcam with Super High Dynamic Range (SHDR) to let you interact with your gaming buddies via top-quality video. The OMEN series by HP is a force to reckon with in the world of gaming, with the products infused with reliable performance as well as immersive graphics. 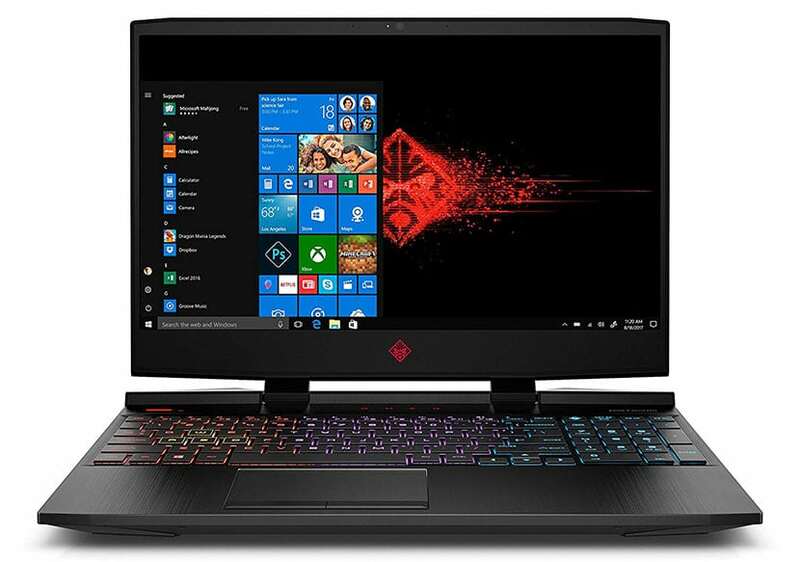 The HP OMEN 17-an120nr is a 17.3” device powered by an Intel Core i7 processor, NVIDIA GeForce GTX 1060 graphics, and a 144Hz display. The monitor is fitted with an anti-glare panel; it also benefits from the G-SYNC technology that minimizes stuttering. Things sound divine in the auditory realm with Bang & Olufsen audio. The processing prowess of this HP laptop is dependable. You get 16GB RAM and 128GB of SSD storage (with 1TB HDD). This is enough to run most present-age games, but you can upgrade the memory depending on your requirements and budget. A surprise bonus is the battery backup: it lasts for 6.75 hours on mixed usage. Even if you use the laptop for wireless streaming, you should still get about 4.25 hours of juice. The unplugged usage comes in useful when you don’t have immediate access to a power station but are unwilling to put gameplay on hold (because that would be unthinkable!). This HP OMEN has a gaming-friendly keyboard that supports macro keys, 26-key rollover, anti-ghosting, and a 10-key numeric keypad. These features simplify gaming by registering frantic, consecutive movements without messing up. Simply put, this is one keyboard that has gaming in its veins, down to the rims of the buttons. There’s one setback you will have to deal with for this mammoth package: loss of portability. This gaming laptop weighs about 8.33lbs and is 1.3” thick. So, it isn’t your ideal pick if you want a computer that travels light. However, it does support 802.11ac Wi-Fi and Bluetooth 4.2 and offers a built-in webcam to let you stay connected. 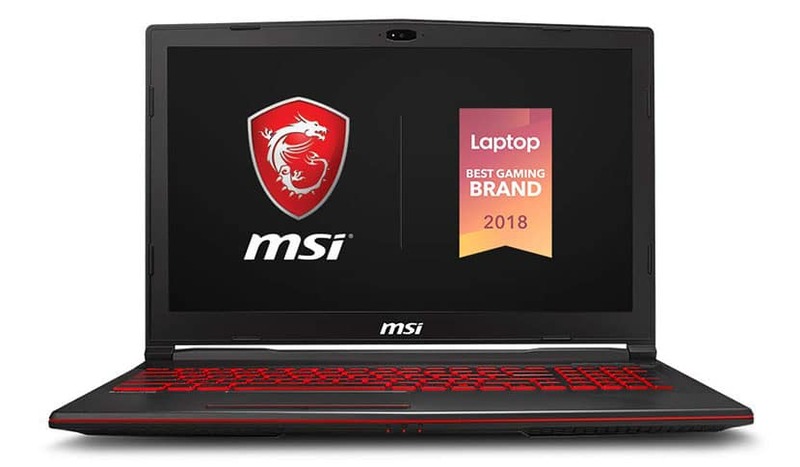 MSI has, over time, developed a solid reputation for building sturdy, performance-oriented laptops that combine modern trends with a quintessential core. The 15.6” MSI GV63 8SE-014 follows this legacy, with its Intel Core i7 CPU, NVIDIA RTX 2060 graphics, and swift-response-time monitor (3ms). The anti-glare display provides crowd-pleasing benefits, the highlight among which is a color gamut of 94% NTSC and 100% sRGB. Note that the refresh rate offered is 120Hz—a tad lower than the optimal 144Hz but still adequate for many modern games. The latest RTX graphics card lets you delight in the power of real-time ray tracing—a futuristic technology where in-game light imitates the behavior of light in real life. It also enhances gaming imagery using artificial intelligence, creating genuinely breathtaking worlds. Remember: RTX gaming laptops are still considerably pricier than GTX laptops, which is another reason this offering is a steal. To be able to deliver the superior performance that it does, this computer is equipped with up to 32GB RAM and 256GB of SSD storage (and 1TB HDD). The Cooler Boost 5 technology uses an assortment of two fans, two exhausts, and six heat pipes (copper) to keep the system cool and functioning sweat-free. On the whole, this laptop is stylish and portable with a weight of 4.8lbs (thickness: 1.2”). It has a sleek, clean chassis with the standard red-lining design of MSI and a gaming keyboard with translucent key edges. We particularly love the MSI App player—it helps you to game on seamlessly between your laptop and mobile phone. Enhancing the standard audio output is an audio enhancer by Nahimic 3 Digital 7.1. The Killer LAN deserves special notice too, for the neat way in which it helps you prioritize network traffic for your game. Dell’s answer to the cut-throat competition in the gaming laptop market is the mighty ALIENWARE M15—a 15” machine that is super-thin at 0.7”, lightweight at 4.78lbs, and boasts of battery life of almost 17-hours. The astounding battery backup—the highest on this list—is courtesy of a specially engineered 60WHr battery; you can also opt for a 90WHr upgrade. 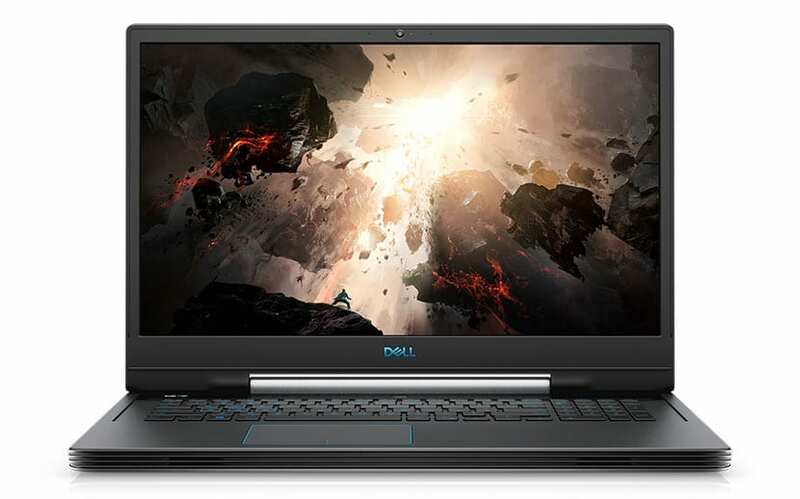 Energized by an Intel Core i7 CPU, up to 32GB RAM, up to 512GB of SSD storage (dual drives are also available), and NVIDIA GeForce GTX 1060 graphics, this machine is potent, and yet mobile enough to come along with you on travels. The FHD screen comes with a refresh rate of 144Hz and offers a brightness of 300 nits. The color gamut supported is 72% NTSC. Along with an IPS panel and a narrow border design, this makes the screen perfect for absorbing gaming experiences. The RGB-backlit keyboard with AlienFX lighting boosts the glamour of the display perfectly, also uplifting the ease of use with its alphanumeric keypad. Plus, the lights stretch across six independent zones, thereby creating glorious ambiances for your gaming sessions. At the exterior too, Dell spellbinds with an offering that is as durable as it is sleek. The construction uses magnesium alloy which is among the lightest of structural metals. The magnesium and steel combo provides rigidity and comfort at the same time. In the cooling department (Cryo-Tech), the use of copper is a smart thermal choice of material. You can choose between two color combos: standard silver and a striking nebula red. This device also offers Killer E2500 to limit the lag and jitter in your game. It is possible to upgrade to the Killer 1550 with Killer DoubleShot Pro to prioritize your internet traffic in line with your gameplay. If you liked the 17” HP OMEN (#4) but are on the lookout for a smaller machine, then you will appreciate what the OMEN by HP 15-dc0030nr brings to the table. This device is a stylish blend of features that all gamers covet: an efficient, speedy processor (Intel Core i7), a dedicated GPU (NVIDIA GTX 1060), a pleasing display (144Hz FHD screen with anti-glare and IPS), and a fair amount of portability (5.56lbs and 1.02”). The VR-ready monitor uses a micro-edge design to make your content seem more alluring and free of external interference. Additionally, this laptop boasts of a splendid audio system by Bang & Olufsen for life-like and clear sound. Put all that in the perspective of HP’s hard-earned assurance, and you have a winner. Supporting the high-speed processor is 16GB RAM and a storage configuration of 128GB SSD (with 1TB HDD, upgradable). 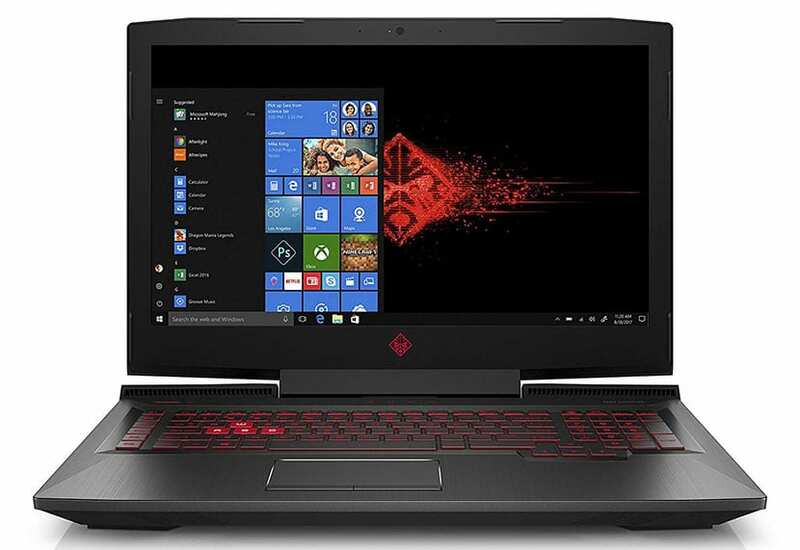 This laptop comfortably runs popular games like Fortnite, Overwatch and PUBG, offering decent battery backup while at it—6.25 hours on mixed usage. To keep the proceedings sustainable, it has a three-phase motor and a fan with large blades to ensure efficient heat dissipation. The result: long hours of uninterrupted gaming, your experience uninhibited by a heat-induced slowdown. Like its larger sibling, this HP laptop also offers a stunning gaming keyboard with RGB lighting and outlined WASD keys. The latter is useful for instant recognition when you are in the middle of an energetic gaming episode and need to make split-second decisions. It also supports 26-key rollover, anti-ghosting, and a 10-key numeric keypad. The compatibility with 802.11.b/g/n/ac Wi-Fi ensures consistent, speedy connectivity that does not become an impediment as you defeat competitors on digital battlefields. Welcome to Dell’s 17-inch gift to the world of gaming—the Dell G7 17 7790. It has a remarkably sleek profile at 0.98” which is stupendous for 17-inch gaming machines, many of which tend to be bulky and awkward to account for all that power. Inside, you will find an Intel Core i7 processor, 8GB RAM, 128GB of SSD storage (with 1TB SATA hard drive), and NVIDIA GeForce RTX—a combo capable of powering your favorite games now and, in all likelihood, several years to come. The RTX GPU is a massive improvement over its predecessor (GTX), offering manifold performance, enhanced graphics, and a future-readiness that embraces special effects, lighting, and captivating gaming arenas. Don’t believe for a moment that Dell does not invest in screen styling. With a standard purchase, you get an FHD screen with an IPS panel for ultimate viewing comfort. But depending on your needs and budget, you can also get a G-SYNC display for (almost) flicker-free viewing. If you want to plug in to an external monitor, you can use the Thunderbolt 3 port to connect to one 5K or two 4K displays. The brightness of 300 nits is perfect for vivid imagery. The peripherals match up too; in this case, the backlit keyboard comes with the option to upgrade to 4-zone RGB. One feature we totally love? The acoustics! This machine is fitted with two speakers and a Nahimic Sound Center to create compelling sound. You can use intuitive voice controls for visual sound-tracking during your game. Bonus: To enjoy increased data throughput during online games, you can choose to upgrade to Killer 1535. It uses the “ExtremeRange” technology to touch your internet connectivity with a dash of magic. 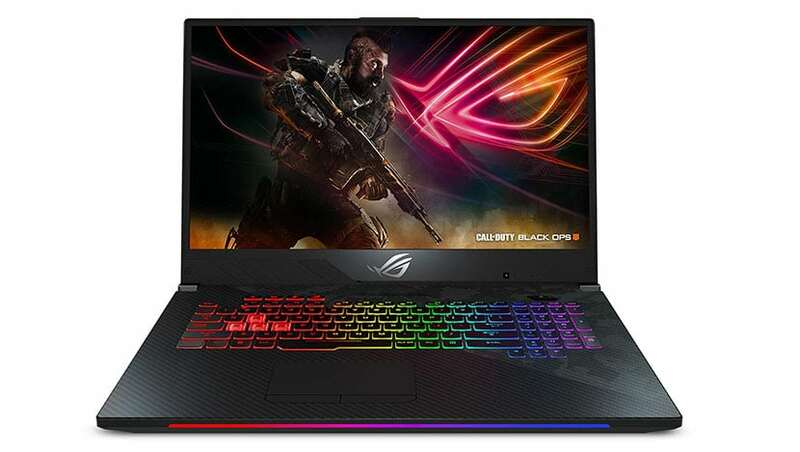 One of the cheapest gaming laptops on the list, the ASUS TUF FX504GM-ES74 is a 15.6” powerhouse fueled by an Intel Core i7 CPU and NVIDIA GeForce GTX 1060 graphics. An FHD screen with a refresh rate of 120Hz and a response time of 3ms builds terrific gaming experiences, while the excellent specs of 16GB RAM and 256GB of SSD storage (with 1TB HDD) ensure you can run (almost) any AAA title and not come off disappointed. It is also one of the lightest 15.6” gamer you will find, with a weight of 5.07lbs and a thickness of 0.98”. If the convenient blend of form, function and finance takes you by surprise, well, that is one area where ASUS has carved an unmistakable reputation for itself. The major computer manufacturer has infused this product with commendable durability. Two anti-dust fans work overtime to keep the CPU and the GPU cool during gameplay. The backlit keyboard is torture tested for 20-million keystrokes so that you needn’t worry about your frantic finger-work leading to a collapse. It is worth mentioning the unique, gaming-friendly design of the keyboard: scissor-switch keys with 0.25mm keycap curves. This helps to make access tactile and smooth, especially when you need to hit multiple, consecutive keystrokes. How about the device support and web connectivity? Well, you can connect to the internet easily with the Gigabit Wave 2 Wi-Fi; there are several USB ports for your devices and peripherals. Big perk: This purchase now comes with the GeForce Fortnite Bundle. You stand to get the GeForce FORTNITE COUNTERATTACK set; we daresay that is quite some return gift! The final laptop on our list is another Dell—the Dell G5 15 5590—and close on the heels of its sibling in #8. 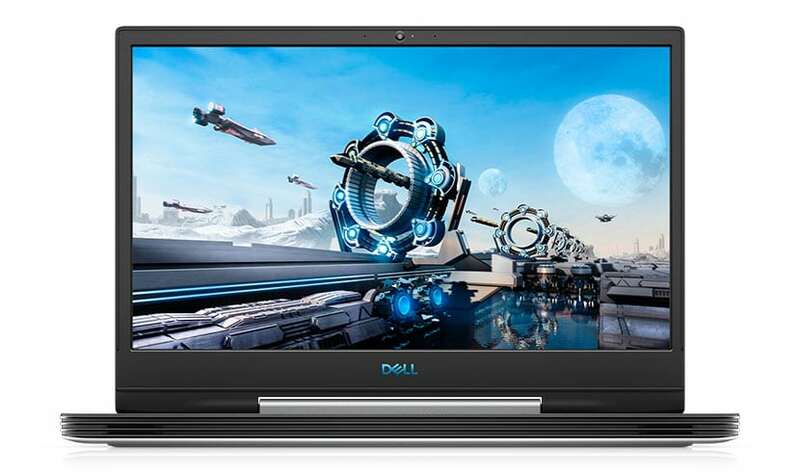 This 15” computer matches its larger sibling in several areas, including performance and display, and that is splendid for ardent gamers looking to extract the most from their 15-inch machines. Fueling this laptop is an Intel Core i7 CPU, supported by 16GB RAM, 128GB of SSD storage (with 1TB SATA), and a dual-fan cooling system for effective heat management. A dedicated GPU—NVIDIA GeForce RTX 2060—brings you a high-quality A/V experience suitable for fast-paced gaming. A handy provision in this laptop (as also in its sibling) is the Alienware Command Center that lets you calibrate the system to align with your gaming needs. You can easily jiggle the hardware and other system settings, creating a personalized environment that enables you to perform at your finest. This computer has a rich display that offers you an engaging, narrow-bezel experience. The FHD screen provides an anti-glare panel and IPS support for undistorted viewing across positions. Interestingly, this device is committed to looking the part. Its premium metal finish is a sight to behold, with the white color accentuated strikingly with blue accents. At the bottom is a transparent glass window, presumably to give you a view of the engineering inside. Secretly we think it is a design element intended as much to up the swagger quotient as the transparency of the build. Note that this laptop weighs about 5.9lbs and measures 0.93” in thickness. Here too, you can opt to upgrade to Killer 1535 for stronger internet connectivity with greater data throughput. This is especially useful if you are fond of online gaming marathons with your peers and virtual friends. Of course, the device supports the standard 802.11ac Wi-Fi and Bluetooth. Have you decided on your gaming laptop yet? As times change and video games evolve further, gaming machines are also working harder to deliver gratifying experiences. The market is resplendent with productive competition, where giants like Dell, MSI and HP are matching wits with innovative players like ASUS and Acer. It isn’t straightforward to offer dazzling performance with engaging graphics at a budget-friendly price. However, the evolution of design technologies and architectures has helped bridge the gap between cost and future-friendliness to a large extent. When shopping for your gaming soulmate, a good way to start is by enlisting your priorities. For instance, you might covet a gaming machine that, along with cost effectiveness and a 144Hz display, also adapts well to outdoor marathons and peer-events. In this case, you should zero down on a laptop with good battery back-up (#6). If casual gaming is more your cup of tea, you can save some precious dollars by getting #3 or #9. For a future-ready gaming machine equipped with stellar features for professionals and competitive gamers, we would recommend #1, #2 or #5. Whatever you do, remember this: once skill and tact are accounted for, your game can only be as good as your gaming machine.